It has been a hard day at work. I was trying to close a deal. Everything that could go wrong, went wrong. Not only that, the salmon I had in my lunch box was poor. The only food I had before 19:30 was a pear and a Nutrilett Chocolate. In the afternoon, I had to use the crutch again. I could barely walk. Anyway, everything worked out during the evening. 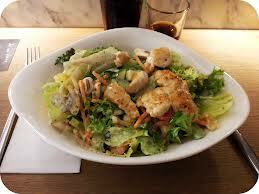 I've just eaten a big salad with tenderloin at Vapiano. The energy crisis has subsided. The order is restored. Tomorrow is a new day.